Widowz Healing Blog | Welcome to my blog about the experience of being a widow. Exploring what thoughts, feelings, emotions, and opportunities for growth and healing that are now showing up in my life. Two weeks ago I buried our cat, Thunder. He was 15 years old. The house has been so quiet with him gone. Every day when I come home, I notice that I instinctively start to look for where he is – and then remember that he is no longer here. My daughter moved out in January. Then it was just Thunder and me. Now I’m a total empty nester, and it really feels lonely. The first cat I ever had was when I was given a kitten in the mid-1980’s. I was living in Connecticut in the woods. I called him Rocky. He didn’t like to be picked up but loved being petted. When he was a year old, he was run over. A neighbor found Rocky and buried him for me. I was devastated. I had no idea I would be so upset, so sad and grieving. Never having had pets growing up, I thought that saying, “I can’t see you now, my cat just died” was overstating the situation. I was so total wrong. I was heartbroken. Losing a cat – or dog – is like losing a family member. Grieving an animal is the same as grieving a person. It’s a heart connection and it takes time to get over the change and the sadness. Last year in May, my daughter and I buried Clare, our female cat. She was 16. She had been losing weight and not doing well for several months. Thunder went through quite a mourning period after Clare was gone. They had been together his whole life. He lost weight and was hiding under the deck. I thought he was dying. He finally came back but not as healthy as before and required special food and care. The last couple days of Thunder’s life, I could tell he was on his way out. He was wobbly, not eating and drinking a lot of water. On Sunday, I kept an eye on him and kept him close by. I called the vet on Monday morning and got an appointment in the afternoon to put him down. Mid-day I found Thunder under the deck and could not get him to move. I had to drag him out. I brought him inside and sat with him on the living room couch. We sat there together for several hours. I cried as I petted him. He was such a sweet guy and had been my buddy following me around, keeping me company while I worked in the office or in the garden. I took him to the vet and he passed peacefully. I then drove up to my friend’s home where we dug a grave next to Clare and buried Thunder. Now there are 2 cats and 3 dogs in her pet cemetery. I made an altar for Thunder in the front hall so that I could have a focus for remembering and mourning him. 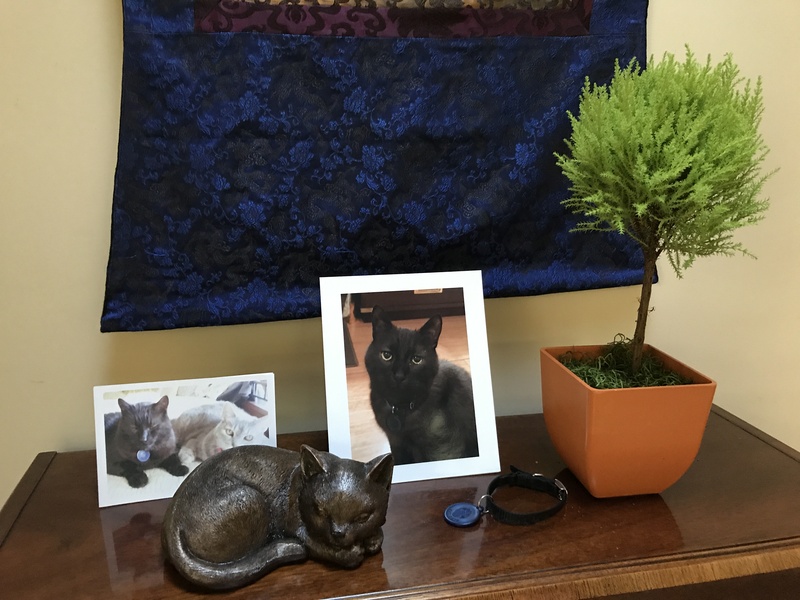 It is also to honor him for being part of our family and includes pictures, his collar and a cat sculpture I purchased to eventually put on his grave. 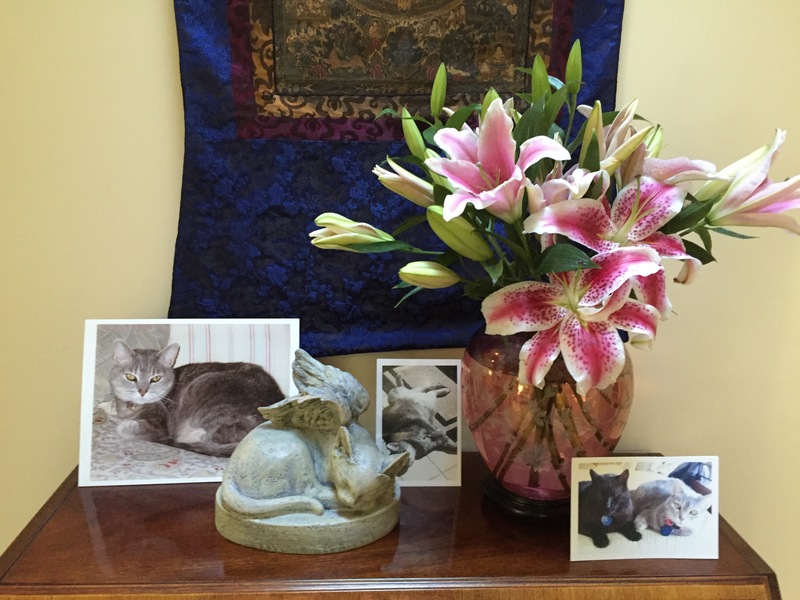 I created an altar for Clare after she was buried – and left it up for a good month or more. I will probably do the same for Thunder. My daughter was ten when she picked him out from 3 kittens neighbors left behind when they moved in the summer. We had an opening for a cat as our male cat, Hugger, was gone. She really wanted a black cat and there he was with big gold eyes. He got the cute kitten award at the vet when we took him in to get checked out. She named him Thunder. When the first rainstorm arrived late in the fall, he was out all night. He loved being in the rain. We knew he was not a normal cat. As he got older, we discovered he had what they call smoke fur – he looked like a black cat but with white on the inside half his fur. Since Thunder and Clare were such a big part of my daughter’s family life growing up, I’ve started making a book of their pictures. It helps to remember all the joy they both brought to my daughter and me just by sorting through 15 years of photos on my laptop, putting them online and starting to arrange them on pages. I realize this is another ritual – in addition to the altar and the burial ceremony. All these help to remind me that Thunder and Clare live on in my heart. It’s funny that a critter that doesn’t talk much would take up such a large space in my home and heart. I’ve found this with all my cats. I was surprised originally that cats were such wonderful company. After 35 years of cats, I’m taking a break. I will explore what freedom is without anyone at home I need to take care of. It doesn’t mean that I’m not sad that Thunder is gone. This is an ending and a beginning. 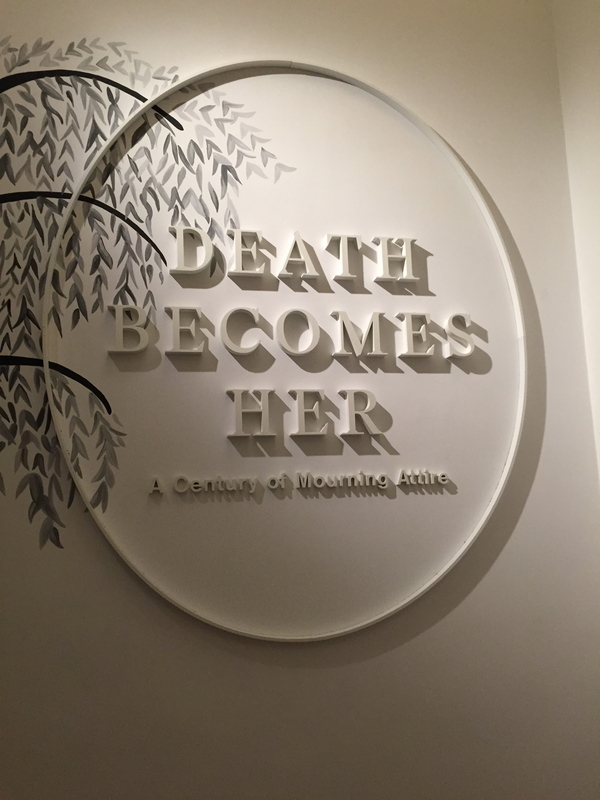 Yesterday I visited the Costume Institute exhibit at the Metropolitan Museum in New York called “Death Becomes Her, A Century of Mourning Attire”. The clothes were amazing – such detail in black garments reflecting the fashion of different ages from 1815 to 1915. It also reflected the etiquette of mourning and what was required – most specifically for women, as they bore the most responsibility for visibly expressing the mourning and grief for their whole family – as well as reflecting their social standing and “level of respectability”. Sometimes children would wear white instead of black – the absence of color – with black trim. I didn’t know that wearing black to represent mourning dates all the way back to the late Middle Ages. In the 1800’s the rules of mourning etiquette were very prescribed. The periods for what to wear were divided into stages from “unrelieved black” for first stage mourning moving to black and white, or gray and mauve, which reflected the “easing of one’s grief” – moving from middle mourning into “lighter mourning”. How long the periods lasted depended upon the relationship of the deceased to the mourners. A widow would wear black for two to four years in deepest mourning for her husband. For the mourning of a father or mother black was worn for one year, and for a brother or sister for six months. Just putting on the black garments reminded those of why they were doing so as “tangible evidence of the reality of their husband’s or family member’s passing, a way to accept the death, to keep the memory alive, as well as working through one’s grief. As fashions evolved, mourning attire reflected these fashion changes. At the same time, widow’s mourning attire in Europe and America was originally “rooted in monastic dress of the Middle Ages: The “habits of nuns remained emblematic of the modesty and chastity that widow’s mourning should signal as a renunciation of worldly allure”. Queen Victoria donned widow’s black clothing when her husband died in 1861 and continued to wear it until her death in January, 1901. When riding a special train to down to London for her funeral, one woman was quoted as saying, “We were all in deep mourning and the ladies wore crepe veils like widows”. This reminded me of seeing Jacqueline Kennedy wearing a black veil for the funeral of her husband, John F. Kennedy. This attire was not something I usually saw in the 1960’s. It seems it was a reflection of the formality of the ceremony of that sad day and the position of JFK as president of the United States. I think we are still inclined to wear black for funerals and memorials much of the time, although wearing black no longer indicates mourning. Wearing black shifted into a fashion statement early in the 20th Century, making it more confusing to identify those in mourning. For my husband’s memorial, I didn’t want to wear all black. I wore a long black silk skirt with a green cashmere top. A friend of mine told me she wore black for two years after her husband died. This was clearly a huge part of her grieving process. Without the signals that clothing used to give when someone was in mourning, it’s not so easy to know or remember when one might be grieving. Perhaps, it would be helpful to bring back some practices of mourning or to re-create options that echo this history of mourning attire – and allow each person to choose what works best for them. Another article I wrote in the fall of 2014 – that I didn’t post. That last sentence nails it. “We are left with a hole that the energy that powered the person through life once filled.” That’s why I felt empty, at a loss – a loss of presence, of energy, of aliveness when Mike suddenly departed. Yes, with all the mannerisms, habits and behaviors that I loved or drove me crazy but with him gone, I missed them all. As I have said before, when Mike passed on to the “next expression of life”, I knew he was and is fine. I was the one left to adjust to the change. To learn how to live with that hole that suddenly appeared. Actually, to first feel the feelings of loss, of sadness, of whatever I am feeling. Feeling my feelings was not a practice I learned growing up or during most of my life. I was more focused on action, doing and thinking. In the last ten to fifteen years, I have learned more about feeling my feelings – even being aware of what my feelings are rather than what I think. In every experience, I know there is a gift. Some call it the silver lining. Mike’s death gave me the gift of learning to really accept my feelings, to dive down deep into them, and to be present with my feelings – to allow them. Our society doesn’t always encourage us to stop and feel our feelings. We have to move on. What’s next? Keep on keeping on, rather than stopping – to pause and ask, what am I feeling now? Sometimes, especially in the first 2 to 3 years after his death, feelings of grief would come like a wave that crashed over me and I would be overcome with the grief and sadness. Only after developing a practice of diving into the waves of my feelings, could I discover how to collect the energy, the aliveness, the love that was Mike and bring it into my heart to fill the hole. What I have learned is that this process happens over time. It’s not a quick fix. Years, it takes years – and that’s ok.
“Bereavement. Or, Bereaved. Bereft. It’s from the Old English bereafian, meaning ‘to deprive of, take away, seize, rob’.” This quote is from H is for Hawk by Helen McDonald. If you look up the word in the dictionary, bereavement means a period of mourning after a loss, especially after the death of a loved one; a state of intense grief. Another definition a little closer to the origin of the word is: the condition of having been deprived of something or someone valued, especially through death. Today, I think we refer to bereavement as a time of mourning, although both are true. There’s no rushing it. It takes years, really. It has its own schedule. A friend’s mother passed away a month or so ago. She said “when the grief train gets through my busy exterior, it’s kind of surprising”. Yes, the grief train doesn’t have a schedule. That wave of grief requires us to feel our feelings when it arrives at our station. We are mourning for being deprived of our loved one, being robbed of that person in our life. They are taken away and we don’t see them again. They aren’t available to talk to, to spend time with any more. That’s the hard part, the hurt part, and it takes time to heal or at least to feel less tender about the loss. It’s not something that can be analyzed or thought through, it touches our heart, our emotion. Emotion is energy in motion, like waves on the ocean. We can’t control the waves and we can control the waves of emotion. Sometimes, when I think of my friend, Jane, the neighbor I met in high school who became like a second mother, and who has been gone for many years now, the grief train arrives at my station and I am brought to tears – missing her. I grieve the unconditional love that she had for me that was so precious. I really I learned what unconditional love is from her. Helen McDonald says in another place in her book, “Sometimes I felt I was living in a house at the bottom of the sea”. Grief requires diving deep into those waves and sitting in the midst of those feelings. We cannot rise back up to the living without first getting to the bottom of our emotions and grief. Bereavement is a station I can be residing in, or not even notice I am still there after so long . . . and surprise, the grief train will stop at my station. I believe the work is to be willing to greet that train, to honor and acknowledge it, and sit with it when it arrives. For more about grief and the difference between grief and sadness, see Karla McLaren’s book, The Language of Emotions. Is it Grief or Loss . . . or Both? In the recent article in the New York Times, The Smell of Loss, the author Julie Myerson describes her experiences smelling her mother-in-law’s perfume a year or more after she had died. Her exploration of why the scent persists at times includes asking scientists and others for their explanation of this phenomenon. It’s a hallucination, a ghost, or the brain’s way of bringing up a memory – a sensory memory, they say. I had a similar experience of scent a month or so after my husband died. I came upstairs to our bedroom and there was the very strong smell of coffee. He drank coffee every morning. There was no coffee made or being made in the kitchen downstairs. The smell was unmistakably coffee. I did not go searching for where that scent was coming from. I figured he had shown up to say hello. I had not gone searching for why this occurred. After reading this NY Times article, I googled “smelling perfume of deceased”. The first site I found listed the Top Ten Signs from your Loved Ones in Spirit. Turns out I’d had several of these common experiences. Another site from the authors of Hello From Heaven calls them ADC’s – After Death Communications. They have done similar research. Their book of the same name was so helpful to me after my husband died explaining that these things do happen and are quite common. I wasn’t going crazy. In my Internet search, I learned that the ability to smell the fragrance from a deceased loved one is called clairgustance. Hearing a voice is called clairaudience. Getting a phone call is also common. I did get that one. I wished I’d saved it. There was a message on my cell phone that just said, “I love you” – very softly. I knew it was from my husband. I received the message the day after he died. Another common experience is receiving a physical sign. I had a friend tell me there were a lot of butterflies after their father’s funeral. I think my husband showed up as a raccoon in my back yard after his memorial. I didn’t say that, my best friend did. The raccoon just stared and stared at us. A friend’s mother had an owl that visited her every day for a week after her husband died. Another sign is movement such as a photo or picture falling off the wall, or an object is moved. I had that one, too. I gave my husband a small metal heart after we were married and he always carried it in his pocket with his change. I had put in on the altar I created on our bedroom dresser. One day I discovered it had been moved and it wasn’t by me or anyone else. Strange electrical occurrences such as lights or appliances going on or off, or clocks stopping are other signs. Another is that we might hear buzzing noises in our ears. I read that they are communicating from a higher frequency, which may be experienced as ringing or buzzing in our ears. I hadn’t thought about that one being applicable and I don’t think it is for me. I had some buzzing in my ears that got more pronounced after the Elton John concert I attended this summer. Overall, from what I have read and experienced myself, I do believe these experiences are real and they are not a hallucination. So many people have had these experiences. And, sometimes the inexplicable is just that. I’m ok with that. Are you? Why Do We Send Flowers? I recently planned and coordinated a Memorial for a client. In two weeks, I helped her decide who was speaking and what was included in the service, as well as what photos, quote and song to be printed in the program. I made cards (8.5×5.5) for the guests to write a note to her and her son in place of a guest book. Many friends donated food and one made beautiful floral arrangements that included white lilies, her husband’s favorite flower. After the Memorial, I insisted she take the flowers home. I put the two large arrangements in her car to make sure she took them home. Two days later she texted me, “you were right about the flowers”. She was referring to my first blog post when I had sent her the link to my widowzhealing blog a few days before the memorial and when she couldn’t sleep, she read all the posts. I hoped this meant that she felt the love and support of those that were present at the memorial – and that it also represented the love her husband had for her and her son. About a week later I asked her what she discovered about the flowers. She said, “I am happy to have them, but I also see their impermanence . . . just like life”. The article was about working in a flower shop, the stories people share when they buy flowers, and the variety of messages on the accompanying cards. This note was unusually honest: ‘Cards and flowers seem so lame when someone dies but we are thinking of you and want you to know’. This definitely says what is true. We want to send our love and heart-felt caring to friends and family when they experience the loss of a loved one and, it IS hard to know what to say. Flowers say it for us, though not usually with such a direct message included. For me, the beauty of flowers also represents the beauty of life. 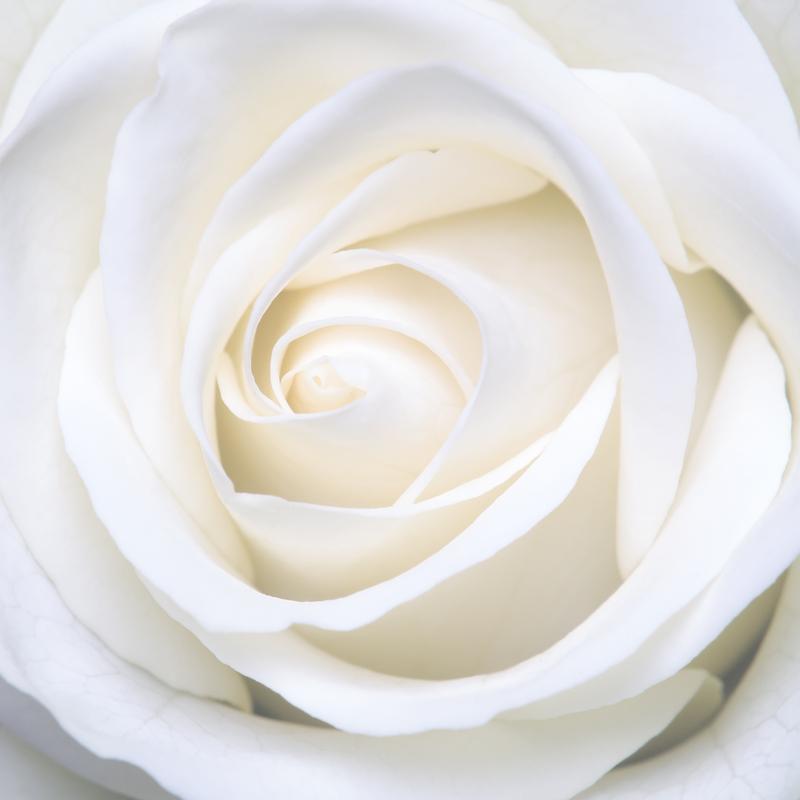 They are alive, beautiful and ephemeral – a reminder to honor the preciousness of life in each and every moment.